Restaurant Salud y Vida Continues to Grow After Over 13 Years in Business – The Owner’s Dream of Cultural Food Institute Becomes a Reality. Their small restaurant, originally located on a side street in Hauraz, has been through a number of transformations and four or five location changes, only to come full circle back to its original location on Avenue Leonisa Lescano 632. Their new/old location is bigger than it was 12 years ago. They’ve added a second floor, a full professional kitchen and more seating. The second floor also doubles as a meeting and lecture space for David and Gracelia to deliver programs. Their Cultural Food Institute is a lifelong dream which continues to morph. They cover topics from healthy eating and digestion to larger issues such as factory farming and its byproducts. They teach to the locals as well as visitors from Lima and other countries. David’s other job is a school teacher, and he loves to teach. His warm subtle teaching style is laced with subtle humor and a quick wit. MSI’s blog will go into more details on Sanchez’s Institute in another entry. Stay tuned. I first met the two with their *small family of six, (including my future God child, Joseph who’s now 11 years old), when they nursed me back to health after a serious bout of traveler’s bug. I ended up spending almost a month at their restaurant. We became good friends. I and a traveling buddy were asked to be Godparents of their son, Joseph, which we gladly accepted. *The family now proudly numbers eight wonderful children, who all blend well together, the older girls helping with cooking and chores and some basic childcare. Back then we talked about their opening an Institute to educate the public about good eating habits. Now it’s a reality. Besides getting an education at Salud y Vida, Gracelia’s vegetarian fare can’t be beat. Don’t be fooled by the humble decor when you visit their restaurant – Gracelia is a master cook. Her vegetarian tortilla de vedura (vegetable pancake) has been my favorite for over twelve years. Also try her homemade granola with yoghurt and fruit. I’m admittedly a little biased – they’re great friends, but if you’re headed to Huaraz, make sure you stop in and have some great food…..and say hi to my God child for me. For more information on Restaurant Salud y Vida, or the Cultural Food Institute contact the author and the contact link at the right of this column. This entry was posted on 28/09/2009 at 21:53 and is filed under Experiential Education, Health, Holistic Living, Inspirational People, Peru, South America, Sustainable Living/Communities, Traveling. You can follow any responses to this entry through the RSS 2.0 feed. You can leave a response, or trackback from your own site. Their address is: Jiron leonisa y lescano #632 or…basically on the SE corner of “Plaza PIP”, just ask anyone for the plaza and you’ll find them. 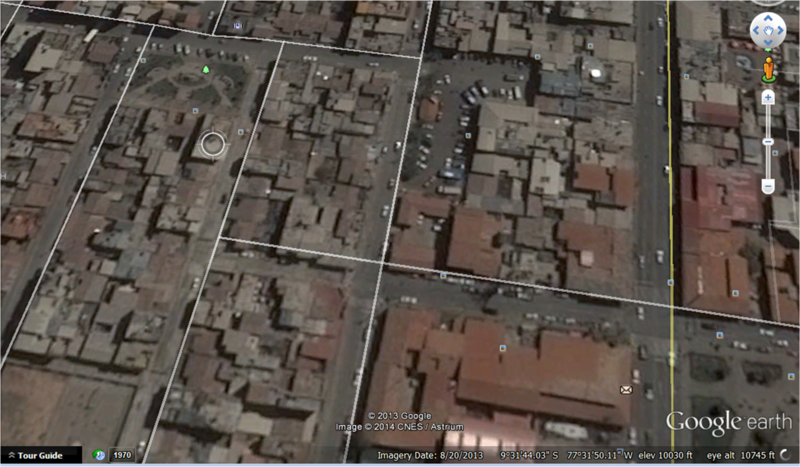 I hope you find them..
I’m also including an aerial image on the blog article. The circle indicates their location. Note the main Plaza de Armas on the lower right of the image, and the maim street indicated by the yellow line, running N/S.